AKIPRESS.COM - President Trump said he wants to pull U.S. troops out of Syria "relatively soon," but cautioned that such a move might not happen right away, The Hill reports. 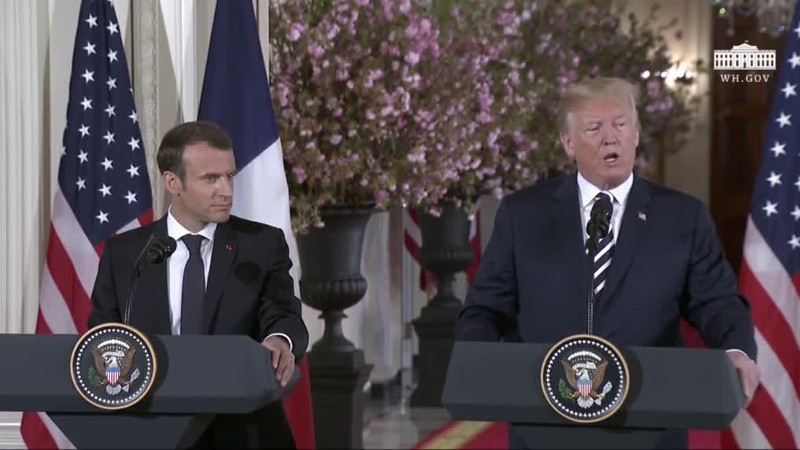 Trump said he and French President Emmanuel Macron agreed on the importance of not allowing Iran "open season" on the region. “We want to come home, we’ll be coming home but we want to leave a strong and lasting footprint and that was a big part of our discussion,” Trump said during a joint press conference with Macron. Trump noted the successful campaign against the Islamic State in Iraq and Syria (ISIS), explaining that the U.S. military has almost completed its work to eliminate the terrorist group from the region. "So we’ll see what happens. But we’re going to be coming home relatively soon," Trump added. Trump added that other countries would have to pay for a continued military presence in Syria, while shouldering some of the military commitment themselves. "The countries that are there that you all know very well are going to have to pay for this," Trump said. "And they will pay for it. The U.S. will not continue to pay. And they will also put soldiers on the ground, which they’re not doing." The U.S., France and the United Kingdom coordinated targeted missile strikes in Syria earlier this month in response to a chemical weapons attack on civilians. Macron told a French television station last week that he had convinced the president to remain in Syria long-term to maintain stability in the region, but later walked back his comments after the White House said its strategy had not changed.